Today's review takes us to the picturesque Iberian peninsula, time to uncork a fabulous bottle of wine from Bodegas Roda. A gorgeous bodega located in the northwestern extension of the Rioja region in Barrio de la Estación, in the town of Haro, in the sub-zone of Rioja Alta. Which sits on the south bank of the Ebro River and is associated with some of the most exceptional wines of Rioja as well as some of its most venerated bodegas (wineries), many dating back a couple centuries. For those of you not familiar with the Rioja region of Spain, it's a place guarded by mountains on all three sides, the area itself takes its ancestral name from a tributary of the Ebro, called the Rio Oja. For the history buffs in the audience, there has been vineyard activity in this region since the times of Roman occupation, even then, people knew this area was fantastic for growing grapes. But it was during the French Phylloxera (vine-destroying insects) crisis that many grape growers and winemakers from France settled in northern Spain and brought with them many of the similar winemaking practices we see in France today, barrel aging techniques, viticulture practices etc..
For those you traveling outside the comfy confines of lets say California, you will find that the Rioja region is a lot different than what you may be used to here in California's wine-country, because much of the regions small growers sell their grapes to merchants or co-operative cellars instead of vinted by and bottling of their own juice. But this is a trend that is changing for many producers. Fact-finders have indicated that a vast majority [75%] of the vino produced in this region is red wine, is produced primarily from the Tempranillo grape. While some of the better wines will be composed of a blend of small amounts of Graciano, Garnacha, and Mazuelo. Speaking of blending, many wines labeled Rioja that you encounter on wine store shelves today will be a blend of one of the Rioja's sub-regions, the Alavesa, Alta and Baja and the capital is La Rioja. About Roda: Their objective was to create high expression wines in a modern style while still being reflective of the Rioja region’s micro-climatic [terroir] spectrum of soil, orientation, elevation, climate, vintage year and traditional indigenous varietals. Bodegas Roda has set the bar high [and a high-bar that is] with Bordeaux as their benchmark in regards to technique and quality. Hoping to evoke the fullest reflection of place in the wines, focused their efforts on old vine vineyards capable of best expressing the terroir of Rioja. 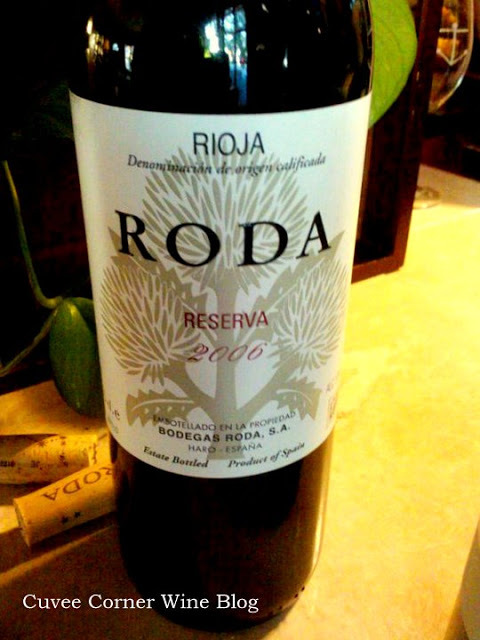 They started Bodegas Roda in 1987, but they found that the 1992 vintage quality was far off the mark, so they sold off the first wines to the bulk-market [similar to the popular butter and jam). Proving their commitment to quality and their goals of making high expression wines, it wasn't until 1996, that Roda's first release hit the market with 30,000 bottles of Roda I and Roda II. 2006 Roda Rioja Reserva: This wine is genuinely is an expression of those stated lofty goals above, and I want to salute them for a job well done in producing a bottle of wine with some substance, something sadly lacking in so much vino today. This wine is a blend of 94% Tempranillo, 4% Garnacha and 2% Graciano, and was aged for 16 months in 50% new French Oak and spent 20 months in bottle before release and has an SRP of $45. What are the pairing possibilities? I'd say endless really, but shorten that list some, it pairs well with a variety of grilled meats [I had it with Spanish seasoned grilled Pork-Chops] and sauteed veggies, a perfect wine-dinner with friends or family as this wine comes to "dressed to impress." Sniff, Swirl and Slurp: At first glance, a nearly opaque ripe-plum colored core. Sticking my fat half-Irish nose into the glass to get my first whiff, bright and intense aromas of sweet, ripe, dark-plum and black currants are married with notes of licorice, mocha and fresh Cubans in a cedar box. A beautiful marriage of new and old world styles meld the dark fruit flavors, a gentle slap of well-integrated spicy oak all over my palate, finishing in a significant and silky expression of minerality and earthy elegance. I gave this wine a score of 89 points and a hearty buy recommendation. If you'd like to grab a few bottles of this wine for your own cellar, I know the folks who can make that happen for you and at the right price. Other Voices: The Drink Hacker had this to say, "A rare Rioja: Fruit-forward, lush, and easily drinkable without requiring a big hunk of meat to back it up. Blackberry and fleeting Port-like characters play with hints of tar and tobacco. Moderate body, but smooth, and with a pleasing, rounded finish. Really lovely. I'm guessing that is an endorsement? But it does seem a little vague, but at least you can see the folks at Drink-Hacker did at least think it was lovely. Full Disclosure: This was sent as a press-sample for the review process. The hopeful takeaway from reviews like this; is to primarily is to encourage you to expand your own vinous horizons, and the Spanish wine scene is a great place to make that happen. There's so much wine from unexplored regions of the world and Spain has so much to offer; to even the garden variety vino-sapiens. And no I'm not just talking about 'bulk' Rioja, which you may see at places like Trader Joe's for example. Do yourself a favor, get yourself to a tasting or two, at your local wine store and no grocery stores don't count. Speaking of tastings, I was just at a Spanish portfolio tasting in Beverly Hills, wines from the Toro region that made my face melt off (to borrow an expression) because the juice being slurped was flat-out winetastic (a technical term). So until next sip long and prosper, cheers everyone!